How can I edit these? What files would I need to modify or add? Does anyone know how to get those same low ammo box backgrounds like in 7HUD? What section of the 7HUD HudAmmoWeapons give you this type of low ammo box background https://imgur.com/a/O3lGW or is there a certain file I need? sugoi_boi_1345How do I fix missing main menu buttons? Thanks, also, sorry to bother you, ServerTimeLimitLabel in HudObjectiveTimePanel moves this timer, and I was looking to edit the timer on top. Thanks, also, sorry to bother you, ServerTimeLimitLabel in HudObjectiveTimePanel moves [url=http://imgur.com/a/aWsDn]this timer[/url], and I was looking to edit the timer on top. Yay another generic yahud question that has probably been already answered in this thread! ExedusYay another generic yahud question that has probably been already answered in this thread! to something like this: http://imgur.com/a/OBoDr --> trying to change the health cross when low or buffed to have a box in the background instead CardfightGamerDoes anyone know how to get those same low ammo box backgrounds like in 7HUD? What section of the 7HUD HudAmmoWeapons give you this type of low ammo box background https://imgur.com/a/O3lGW or is there a certain file I need? [quote=Exedus]Yay another generic yahud question that has probably been already answered in this thread! L ExedusYay another generic yahud question that has probably been already answered in this thread! [quote=L][quote=Exedus]Yay another generic yahud question that has probably been already answered in this thread! yahud (and what I did for ahud) animate a CExImageButton called HealthBG (for hudplayerhealth.res). You can see it here and in the animations here for yahud. The same concept applies for low ammo background. yahud (and what I did for ahud) animate a [i]CExImageButton[/i] called [i]HealthBG[/i] (for hudplayerhealth.res). You can see it [url=https://github.com/whayay/yahud/blob/master/_Huds/yahud-fl%20red/resource/ui/HudPlayerHealth.res#L3]here[/url] and in the animations [url=https://github.com/whayay/yahud/blob/master/_Huds/yahud-fl%20red/scripts/HudAnimations_tf.txt#L47]here[/url] for yahud. The same concept applies for low ammo background. Nokkyahud (and what I did for ahud) animate a CExImageButton called HealthBG (for hudplayerhealth.res). You can see it here and in the animations here for yahud. The same concept applies for low ammo background. HudMatchStatus.res doesn't affect the timer panel itself (the rectangular one with blue, red and black boxes and black points circles, to be exact), unfortunately. I removed the hudmatchstatus.res file from that hud (that DOES have the custom panel) and the panel was still there. Probably these are the vtf/vmf files that make the difference? You also need to add a BgColor (as seen here straight from 7HUD) either from a defined color from the clientscheme or your own with RGBA. Don't forget to also add the pulse stop animations or you're gonna constantly have a low ammo background. You also need to add a BgColor (as seen [url=https://github.com/Sevin7/7HUD/blob/master/scripts/hudanimations_7hud.txt#L201]here[/url] straight from 7HUD) either from a defined color from the clientscheme or your own with RGBA. Don't forget to also add the pulse stop animations or you're gonna constantly have a low ammo background. Don't know if this is gonna help you, but in my case, I was essentially trying to get a box to appear whenever I was buffed or low on a yahud mx that Hypnotize updated on his thread. I just copy and pasted the part that consisted of the health (from hud animations) from the old yahud edit that Nokk linked - basically pasted over a hud animation from yahud that already had boxed health on my version. After that, I just had to disable the health cross. Hope this helps. How do i edit my hit indicators again? Does anybody know how to remove the negative sign from the damage numbers? check grape's videos for an example. maniacalDoes anybody know how to remove the negative sign from the damage numbers? check grape's videos for an example. You need to edit the font itself to have a blank glyph instead. From there you'd just install it like any other font, and use it for damage numbers. [/olist]From there you'd just install it like any other font, and use it for damage numbers. hooliHow do i edit my hit indicators again? How do i edit item meters? I have been able to get stickies and huntsman but im not sure how. i want to back the background grey and the fill green with black text. Epic_How do i edit item meters? I have been able to get stickies and huntsman but im not sure how. As for the background I am unsure. [quote=Epic_]How do i edit item meters? I have been able to get stickies and huntsman but im not sure how. I'm sorry if it's been asked before, but how would one go about changing the health color when either damaged or overhealed? WhyNotDivineI'm sorry if it's been asked before, but how would one go about changing the health color when either damaged or overhealed? you're going to be working with 2 specific events, "event HudHealthBonusPulse" and "event HudHealthDyingPulse"
question of my own: How would I replace the background image that you see when connecting/loading into a server with a custom one? Silvvy SkyH4ighHow do you delete the little Health box thing around the m0rehud health numbers? [quote=Silvvy][quote=SkyH4igh]How do you delete the little Health box thing around the m0rehud health numbers? Zetsu Silvvy SkyH4ighHow do you delete the little Health box thing around the m0rehud health numbers? You can just set the xpos for PlayerStatusHealthBonusImage to 9999 no need to touch anything else! Nexus Epic_How do i edit item meters? I have been able to get stickies and huntsman but im not sure how. 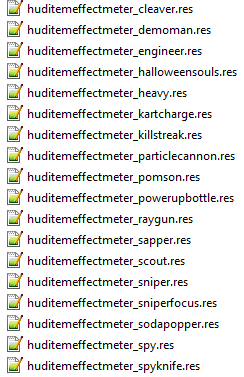 Yeah you need to work with all the "HudItemEffectMeter" files + HudDemomanCharge and HudDemomanPipes for the chargin' targe and sticky/bow charge. If you want to change the background/charge color add "bgcolor_override" and "fgcolor_override" to the "ItemEffectMeter" code inside every file, if you don't have them already. I'm not 100% sure but i think its not possible to change them from there, you have to set the colors from your normal class config files. [quote=Zetsu][quote=Silvvy][quote=SkyH4igh]How do you delete the little Health box thing around the m0rehud health numbers? [quote=Nexus][quote=Epic_]How do i edit item meters? I have been able to get stickies and huntsman but im not sure how. I'm trying to have a little clock symbol next to my respawntimer. Right now I'm using two elements, one for the timer and one for the clock symbol. It's working fine while respawning, but as the clock is a element in spectator.res it also shows all the time when in spec. Is there any way to make the clock element to also only show while respawning? JBI'm trying to have a little clock symbol next to my respawntimer. Right now I'm using two elements, one for the timer and one for the clock symbol. It's working fine while respawning, but as the clock is a element in spectator.res it also shows all the time when in spec. [quote=JB]I'm trying to have a little clock symbol next to my respawntimer. Right now I'm using two elements, one for the timer and one for the clock symbol. 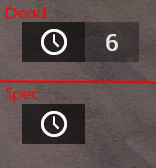 It's working fine while respawning, but as the clock is a element in spectator.res it also shows all the time when in spec.